New Teacher Workshop with Cyd Quinn Returns! Cyd Quinn returns next Friday with her class for new teachers. The workshop is all day Friday, August 3 and is open to all new instructional staff. Quinn’s leadership in mentoring new teachers earned her a “Shout Out” last year from Patricia Gardner, president of SC/TA. 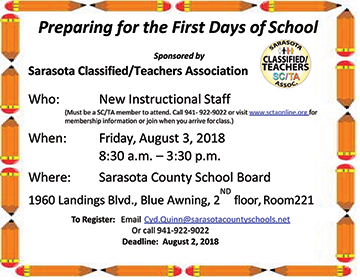 To participate in the workshop, register by the end of the day Thursday, Aug. 2, by contacting Cyd atCyd.Quinn@sarasotacountyschools.net.